Ice, ice, baby! It’s time to freeze out the completion in the fierce Q Swimwear Iced Jammers! Designed by Jinny Zola for Southern Cali’s greatest swimwear company, these cool jammers have it all. 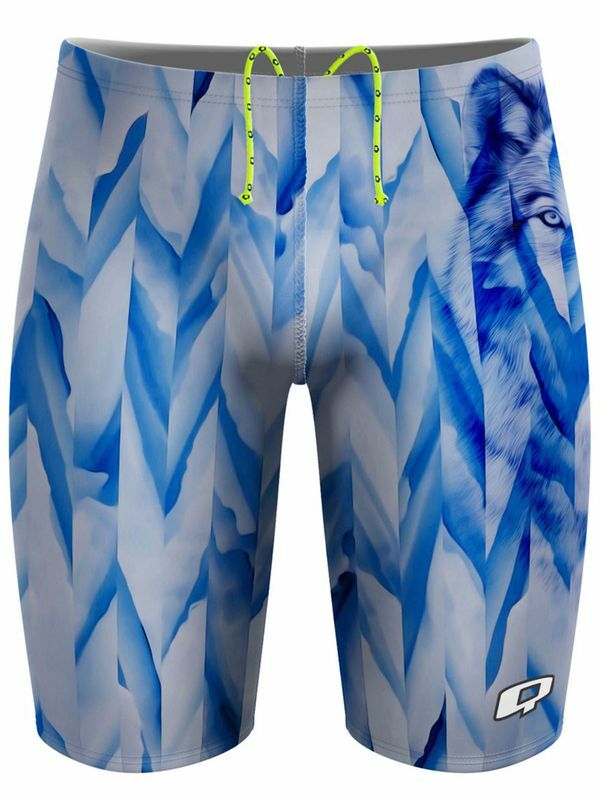 With a snow white design and icy blue geometric accents under a ferocious white wolf, these jammers will have the other guys in the pool shaking like kittens. Made with top quality 53% polyester - 47% polyester Q Swimwear fabric, the Q Swimwear Iced Jammers were made with the needs of serious swimmers in mind. With a second skin compression fit and drag reduction, these jammers will have you flying through the water at top speeds and shattering your old records! Q Swimwear is represents a new age in swimwear that is focused on creativity and self expression. Q Swimwear embodies the laid back, creative and effortless cool confidence representing Southern Californian culture. Q Swimwear pushes the boundaries of what people believe is possible in swimsuit design. All Q Swimwear swimsuit are made from chlorine resistant swimwear fabric. Sizing: The AUS size above will fit similar to Speedo & Arena training jammers of the same size, so you can match your existing size to this.